If you've ever been mesmerized by a hip shaking belly dancer, you'll understand the appeal of being swathed in a scarf dripping with gold coins. Your body essentially becomes another musical instrument for the song to work along with. Every time you make a staccato movement with those hips the keys clink together quickly for a sharper note and when you move fluidly along the shine from those glittering coins will only make the movements more phenomenal. If you can't tell we're a little in love with the idea and we're sure you are too by now. 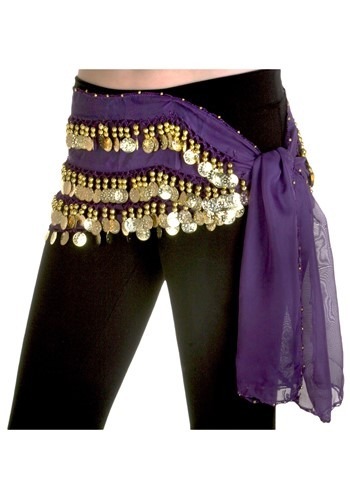 Just imagine adding this to a belly dancer costume or your next gypsy outfit, or heck, we like wearing it into the office here and there. No matter what it will look fantastic and you'll feel ready to show off a few moves of your own when wearing this purple hip scarf.